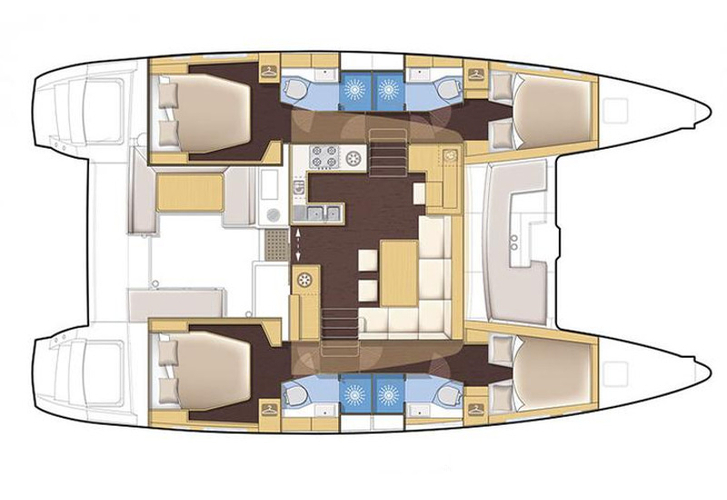 In 2017 has been built boat Lagoon 450 called LAG 450-17- GRE. She is placed in base Athens around Athens in Greece. You can accommodate up to 10 persons on the sailboat LAG 450-17- GRE. Arrangment of beds is 10. There are 4 cabins situated below sailboat's deck. LAG 450-17- GRE is equipped with 4 WCs. Analyze more offers here: Catamarans Athens. Fuel tank is 1000.00 l l. big , water tank has up to 350.00 l l. In this yacht is installed motor 2x40 hp. 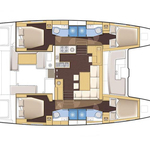 With 13.72 meters of lenght overall and 7.84 m of width LAG 450-17- GRE offers enough space for comfortable sailing. Nonrefundable caution has value 3000.00 EUR. Find more vessels here: Catamarans Athens.